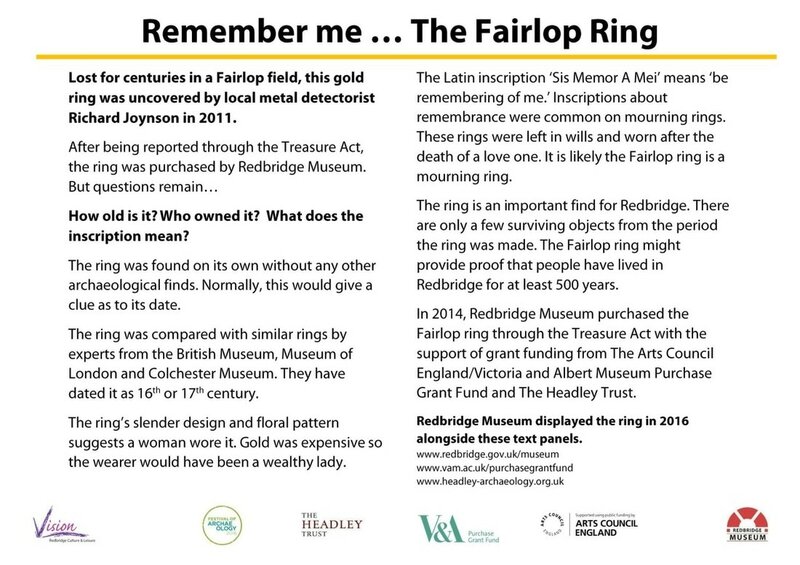 In 2014, Redbridge Museum purchased the Fairlop ring through the Treasure Act with the support of grant funding from The Arts Council England/Victoria and Albert Museum Purchase Grant Fund and The Headley Trust. 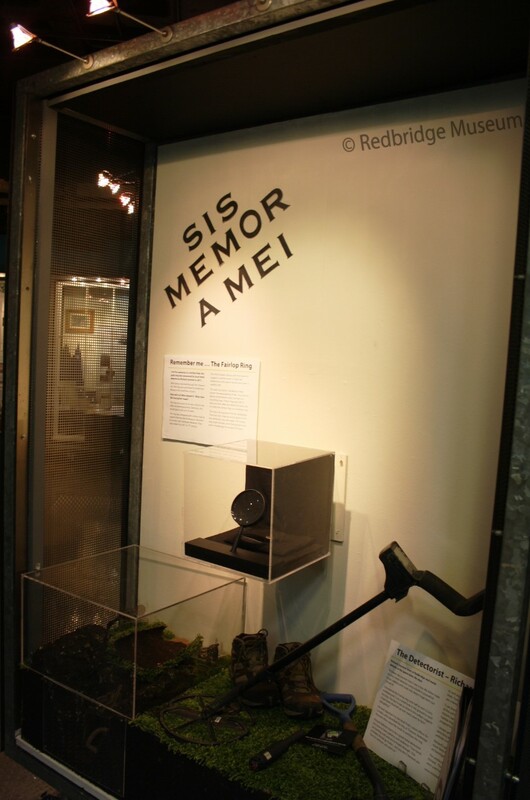 Redbridge Museum displayed the ring in 2016 alongside these text panels. A probably Roman copper alloy mount dating AD43-410. The mount has been cast in the form of a fish or a dolphin with an elongated body which spirals around to form a ring. The tail flares out in a semi-circular shape and projects from the back of the ring. There is a rectangular socket projecting from the upper side edge of the ring. There are two fins which project each side of the head to form horizontal bars; the end of the one of the fins is broken and missing. The body of the fish is decorated with a scale-like pattern and there are flaring lines providing the detail on the tail. The fish has a broad, snub nose and the eyes are depicted by a ring and dot motif. On the underside of the head there is a circular, wedge-shaped lug or small stand which probably was in contact with another element. Objects with similar depictions of fish or dolphins but slightly different forms are published on the Portable Antiquities Scheme database e.g. SWYOR-4D4182; LIN-5C2393 and LANCUM-F79885. Ralph Jackson writes the style of the object is more Roman than Neoclassical and Hazel Forsyth added that she has not seen anything similar in the Post Medieval period. Jenny Hall suggests that it may have come from the side of a bowl and would have had some fitting attached through the rectangular slot, although she cannot find a parallel in the publications. Dimensions: length: 58.43mm; width: 33.43mm; diameter: 27.93mm; weight: 39.08g. 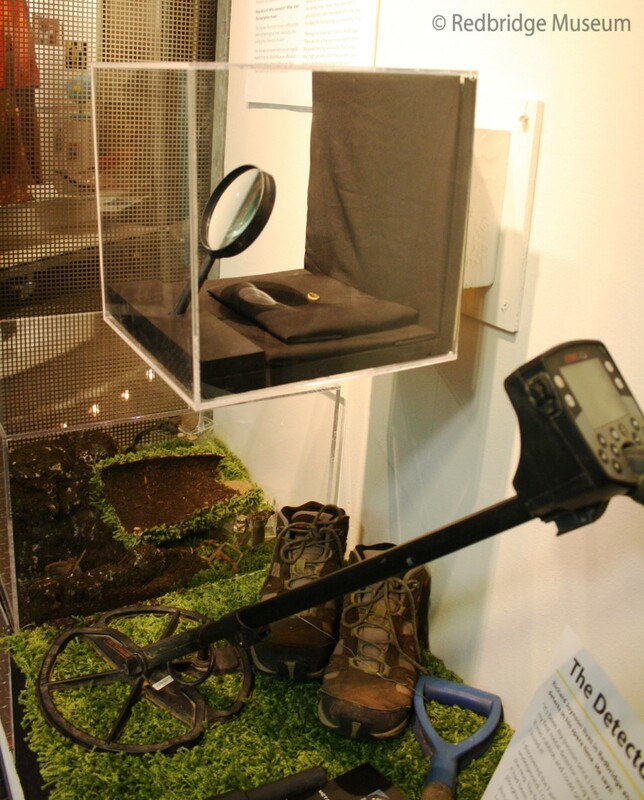 Identification by Hazel Forsyth, Senior Post Medieval Curator, Museum of London. 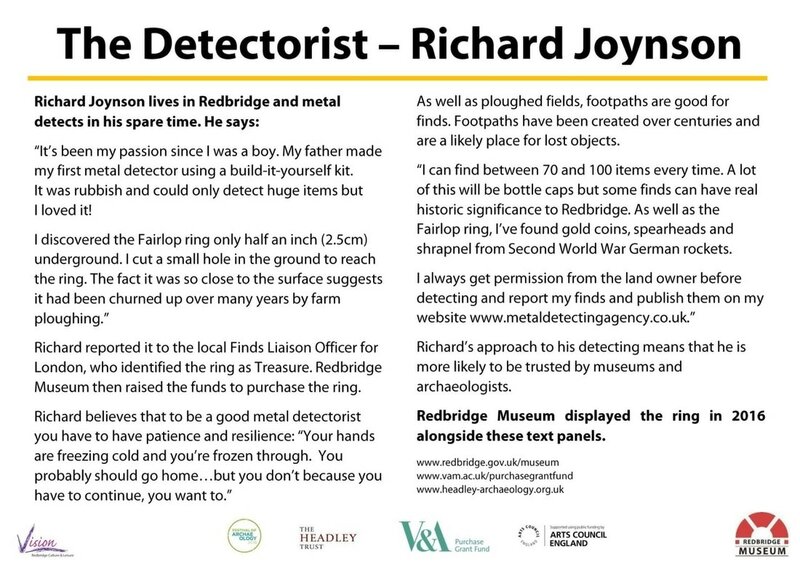 Identifications by Ralph Jackson, Curator, Roman Collections, Department of Prehistory and Europe; The British Museum, Jenny Hall, Roman specialist and Hazel Forsyth, Senior Post Medieval Curator, Museum of London. This is the salutation of the Archangel Gabriel to the Virgin Mary at the time of the Annunciation of Christ's birth. The words carried amuletic significance in the Middle Ages, and were frequently inscribed on rings and brooches. The finger-ring is silver and dates from the fourteenth century. Dimensions: height 26 mm, width 24 mm. Consequently, in terms of age and as the object contains a minimum of 10% precious metal it qualifies as Treasure under the stipulations of the Treasure Act 1996. A post medieval silver thimble or sewing ring. The thimble is made from a rolled sheet. Near the base edge of the thimble on the outer surface are stamped initials; 'MP', on a banner held up by a cherub on either side. Above the initials is a makers mark: '.JC.' within an oval with floral projections. Below the banner is a plain raised border. The rest of the thimble is covered in rows of circular indentations. The top of the thimble is open, and along one side of the thimble is the seam where the edges of the sheet meet. It is now slightly squashed and it measures 16.1mm (diameter at base) x 13.7mm (diameter at top) x 14.6mm (height) x 1.3mm (thickness) and weighs 4.50g. Description: Post-Medieval gold finger-ring, squashed. Exterior decorated... Inscription on inner band, retaining black enamel. Inscription reads: SIS MEMOR A MEI. The latin inscription translates literally to 'be remembering of me', ie. remember me (memora is female version, so this ring would have been given to a woman). Description: Post-Medieval gold mourning ring, with pronounced central ridge on the exterior, once enamelled black. Inscribed inside in lower case ': You must follow G : M Aug: 29 - 57' (probably standing for August 29, 1657), with maker's mark B in an oval. Discussion: The mark is similar to a mark on a finger-ring in the British Museum collections: 1961,1202.143, but this mark has not been identified.